As public worker union growth ran into the realities of an increasingly conservative national climate, effective advocates for labor, like Victor Gotbaum -- who passed away on April 5 --like many of his peers, proved unable to find a way to keep renewing union power. , William E. Sauro / The New York Times. It is not surprising that establishment institutions remembered Gotbaum as a table thumper who, when the chips were down, subsumed the interests of his working-class constituency to the needs of New York as a whole. But the characterization of Gotbaum as a labor statesman obscures as much as it reveals. It perpetuates the myth of shared sacrifice during New York City’s fiscal crisis — in reality the wealthy sacrificed almost nothing and used the looming bankruptcy to shift power away from elected officials and ordinary citizens to the financial elite. It also reduces the creation of collective worker power — in which Gotbaum played a large role — to a minor subplot. In retrospect, the rise of public-sector unionism looks inevitable, but when Victor Gotbaum moved back to New York in the mid-1960s, public worker unions were rare. Even in New York, a center of labor movement power, only a handful of city workers were covered by collective bargaining, and most did not belong to a union. Pay and working conditions in many agencies were miserable, and there was little workers could do about it. The 1935 National Labor Relations Act specifically exempted government employees, and in New York State, the 1947 Condon-Wadlin Act made public worker strikes illegal. Nonetheless, after World War II the general advance of organized labor spilled over into the public sector. By the mid-1950s, pockets of organization and even bursts of militancy were becoming more common in New York, with unions like District Council 37 of the American Federation of State, County and Municipal Employees (AFSCME) jockeying to take the lead in signing up city workers. In 1964, Jerry Wurf defeated incumbent Arnold Zander to become national president of AFSCME. Wurf brought in Gotbaum, who had headed AFSCME’s small Chicago branch since 1957, to replace himself as executive director of DC 37. Born in Brooklyn in 1921, Gotbaum grew up in a Jewish family that hovered between poverty and middle-class life. Unable to afford college, he began work in a printing shop before being drafted into the Army. After the war, he used GI Bill benefits to attend Brooklyn College, where he found himself amid radicals of every stripe — a brief afterlife of the hothouse world of Depression-era student leftism. Influenced by Socialist Party veteran Gus Tyler, Gotbaum allied with the anti-Communist left in the American Veterans Committee. Gotbaum moved to Columbia University after Brooklyn College, completing an MA in International Affairs, and then went to work for the Department of Labor in the Office of International Labor Affairs. Ending up in the embassy in Turkey, and unhappy, Gotbaum switched careers, briefly working for the Amalgamated Meat Cutters before moving over to AFSCME. With the crackle of change in the air, Gotbaum led a series of organizing drives, most importantly in the city-owned hospitals, where the Teamsters had made headway among the largely African-American and Puerto Rican aides, cooks, clerks, and messengers. To head his field operation, Gotbaum brought in Lillian Roberts, a charismatic, African-American nurse’s aide, who had organized for AFSCME in Illinois. The move paid off — DC 37 won three out of four hospital representation elections, and used the momentum to win elections covering school lunch workers, school aides, building cleaners, chemists, librarians, actuaries, lifeguards, court reports, and even institutional barbers. By 1967, DC 37 had won the right to represent the majority of the employees in the mayoral agencies. Wages were negotiated for individual units by job title across agencies, but the basic terms and conditions of work for virtually the entire city workforce were settled by DC 37 in a citywide contract (which covered members of other unions as well). The first agreement, signed in 1969, gave workers eleven paid holidays, overtime pay, shift differentials, and a pension plan that allowed retirement after twenty-five years at 55 percent of a worker’s final salary. A minimum wage brought lower-level clerical and hospital workers a 20 percent salary boost — lifting many above the poverty line for the first time — and a new grievance procedure checked abuse and arbitrary action by supervisors. In the dry details of contract language, a revolution took place. Even with the gains brought by collective bargaining and a series of public worker strikes — by teachers, transit workers, and sanitation workers, among others — the lower ranks of city workers remained poorly paid. Some unions began providing additional benefits themselves, funded by negotiated payments from the city, a model of unionism that had been pioneered by the garment unions. Gotbaum knew it well, having spent three summers working as a waiter at Unity House, the International Ladies Garment Workers Union resort in the Poconos. Under his leadership, DC 37 offered its members catastrophic medical insurance, dental benefits and a union-run dental clinic, a prescription drug plan, free eye examinations and eye glasses, free legal assistance, personal counseling, and a massive education program that included civil service test preparation, occupational training, high school equivalency courses, and a four-year college program. As DC 37 membership shot up to 125,000, Gotbaum built a powerhouse organization out of dozens of separate locals and an extraordinarily diverse membership. Some skilled professionals, like architects and engineers, felt little commonality with blue-collar and low-level clerical workers, but Gotbaum’s skill at social chemistry — and the shared sense of empowerment that came with unionization — maintained a high level of solidarity, even at a time of racial tensions in the city. Gotbaum recruited talented staffers from both academia and the labor movement, giving the council a level of competency and influence few national unions can match today. He also appointed women to high-level posts in areas like general counsel and negotiations that in other unions were strictly male preserves. As DC 37 raised the living standards of its members and its political influence, Gotbaum became an increasingly prominent public figure. 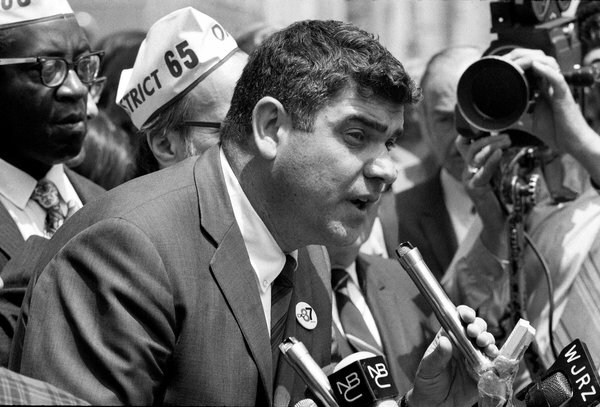 His early and vocal opposition to the war in Vietnam helped bolster the left wing of New York’s labor movement. But as New York City’s economy declined in the 1970s, Gotbaum was slow to see the shifting political tides. In 1971 the governor and state legislature blocked an improved pension plan negotiated by the union and the city. In response DC 37 and its former rival, Teamsters Local 237, took drawbridge workers and sewage treatment plant operators out on strike. The strike sparked a fierce public and political backlash, ultimately leading the legislature to move pensions from collective bargaining to legislative determination, and beginning a slide backward in retirement benefits that has continued ever since. The mid-1970s fiscal crisis brought more serious woes. For years, New York City had been papering over budget deficits with borrowing. But when the national recession hit, banks and other lenders stopped buying the bonds the city needed to roll over its debt and continue operations. As the possibility of bankruptcy loomed, Gov. Hugh Carey and the big financial institutions demanded that the city make massive layoffs and deep cuts in spending, including foregoing negotiated pay increases, as a precondition to providing help. Gotbaum, as head of the Municipal Labor Committee (the umbrella group for city unions), became labor’s key figure in the crisis. At first Gotbaum remained militant, organizing a rally of ten thousand protestors at First National City Bank. But as layoffs and service cuts began, and demonstrations rocked the city, he broke with labor leaders who preferred to see the city default on its debt rather than agree to major givebacks. Gotbaum feared the potentially disastrous effects of bankruptcy for his members. Though seemingly powerful, the city unions were still new and relatively untested — the fiscal crisis struck only six years after the first city-wide contract was negotiated. Gotbaum made the preservation of collecting bargaining and the prevention of default his highest priority, negotiating a concessions package that included deferring wage increases and work rule changes. In return, the city got the federal government to rehire many laid-off workers using funds from the Comprehensive Employment and Training Act. There was considerable opposition to the deal within DC 37 and from other unions, but Gotbaum made it stick. When the austerity measures proved insufficient to lure investors back into the city bond market, Gotbaum, working closely with Local 237 president Barry Feinstein and advisor Jack Bigel, agreed to lend billions of dollars from municipal pension funds to the city, which turned out to be the key to avoiding bankruptcy. By then, Gotbaum had become a partner with top business leaders, especially Felix Rohatyn — an investment banker Carey turned to for help in navigating the fiscal and political shoals of the crisis. In 1976, with disgruntled members suffering from cutbacks, Gotbaum secured the institutional power of the municipal unions by getting the state legislature to pass an agency shop law, forcing city workers to pay unions a fee even if they chose not to join. DC 37 slowly won back much of what it had given up during the crisis, but new deals linked pay increases to productivity gains — a dangerous precedent that New York mayors have returned to over and over. Gotbaum’s role in the fiscal crisis elevated his already large public presence. He and United Federation of Teachers president Albert Shanker — two loud-mouthed, social-democratic Jews, Gotbaum of the left brand and Shanker of the right — became the face of New York labor, displacing the private-sector unionists who once been the go-to figures for politicians and the media. But Gotbaum proved unable to leverage his prominence into greater power. Restless at DC 37, in 1979 he launched a challenge to Wurf for the national presidency of AFSCME. An ugly battle ensued, including within DC 37, where Wurf had important supporters. Loyalty, rather than competency, increasingly became valued within the council, contributing to a changed institutional culture that later allowed corruption to spread. Outmaneuvered by Wurf, Gotbaum ultimately abandoned the race. Gotbaum retired from DC 37 in 1986. As his last act, he maneuvered to make sure he was succeeded by an African American, Stanley Hill, a former social worker and long-time union activist — a pointed political statement at a time when blacks led few major unions nationally and few major institutions in New York City. Under Hill and his successors, the prominence and effectiveness of DC 37 diminished. Gotbaum played a large role in boosting working-class power in New York, but also began the process of membership demobilization and internal patronage politics that contributed to the declining importance of unions in setting the trajectory of the city. A gruff, effective advocate for labor, Gotbaum, like many of his peers, proved unable to find a way to keep renewing union power in the face of an increasing conservative national climate.